contec Cms5100 Patient Monitor Adopts Oscillometry For Nibp Measuring, Photoelectric Oxyhemoglobin Inspection Technology Combining Capacity Pulse Scanning & Recording Technology For Spo2 Measuring. Systolic Pressure(sys), Diastolic Pressure(dia), Mean Pressure(map), Spo2 And Pulse Rate(pr) Can Be Accurately Measured. Compact Appearance, Comprehensive Functions, Simple And Convenient Operation, Which Is Applicable For Hospitals, Community Medical Treatment And Family. 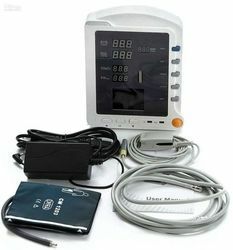 be Applicable For Adult, Pediatric And Neonatal For All-around Monitoring, Easy Operation And High-cost Performance. be Applicable To Medicine, Surgery, Operating Room, Icu/ccu, Emergency Room, Obstetrics And Gynecology, Pediatrics. compact And Flexible Appearance, Easy For Carrying And Be Suitable For Indoor And Outdoor(in Ambulance) Monitoring. display With 2.8' (320×240) Color Tft Lcd And Red And Yellow Highlight Led. visual And Audible Alarm For Systolic Pressure(sys), Diastolic Pressure(dia), Mean Pressure(map), Spo2 And Pulse Rate(pr), And Upper And Lower Limit Of Alarm Can Be Set. unique Flash Memory, Storage For Up To 2000 Nibp Data And 78000 Spo2 Data. convenient And Quick In Inquiring Measurement Data, Review For Nibp Trend Graph Within 24-hour And Spo2 And Pulse Rate(pr) Trend Graph Within 20-hours.